WooHooo!! We are one! No no - this is not some "United We Stand" saga! What I mean is that today marks the first anniversary of my blogging "experiment" as I like to think of it. Exactly one year ago to the day, I wrote my first post. What began as a lark on somewhat shaky grounds a year ago has successfully continued for a whole year. 1 year and 99 posts! Yes dear friends, coincidentally, today also happens to be my 100th post! Thank you friends and fellow bloggers for helping my reach this milestone. Comments, critiques and positive feed backs - it is your valuable inputs that have kept me motivated. George Siemens says "Blogging is best learned by blogging...and by reading other bloggers." I hope that I have learnt something in my journey through the past year - be it through what I read or through what I post. And on that note, let me mark this double celebration with a recipe for cake pops. Also, I had some Gingerbread Cup Cake/Whoopie Pie Mix left over from some past experiment! So I used that to bake my base cake instead of baking my own cake from scratch. The kit came with its own frosting mix, which was an added bonus! Follow the instructions on the box - beat together the egg and butter until smooth, then add in the cake mix and blend it well. Bake the cake in a 9" round cake pan at 350 degrees Fahrenheit for approximately 15 minutes. In the mean while cream the sugar and butter (room temperature) together into a smooth paste, then blend in the frosting mix. Let the cake cool down completely then crumble it. Now, you may knead the cake and the frosting into a smooth dough using you hands or in a food processor. I used the latter. The cake will still be a little crumbly, but the frosting will make the mix moist enough to hold a ball shape. Now, using an ice cream scoop or cake ball or meat baller, shape the cake and frosting mix into smooth balls. 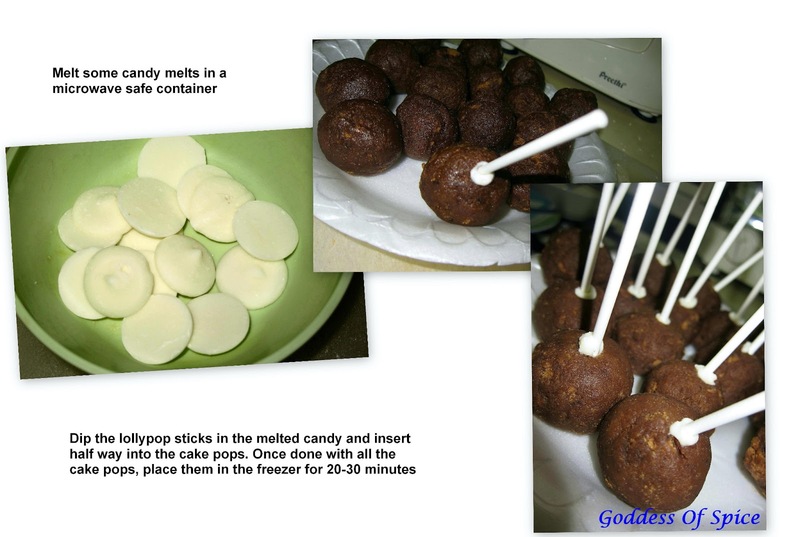 Melt a little of the white candy melts in the microwave, dip the lollypop sticks in it and insert it halfway into the cake balls. Keep these in the freezer for about 20 minutes. Now melt the remaining candy melts as per your color choice. Take out the cake pops from the freezer, dip them in the melted candy, decorate them as you wish and insert them into Styrofoam blocks for setting or use an overturned colander as I did. Delicious cake pops are ready to be eaten. While adding the frosting, take care and add a little at a time. You won't be needing more than 3-4 tablespoons. 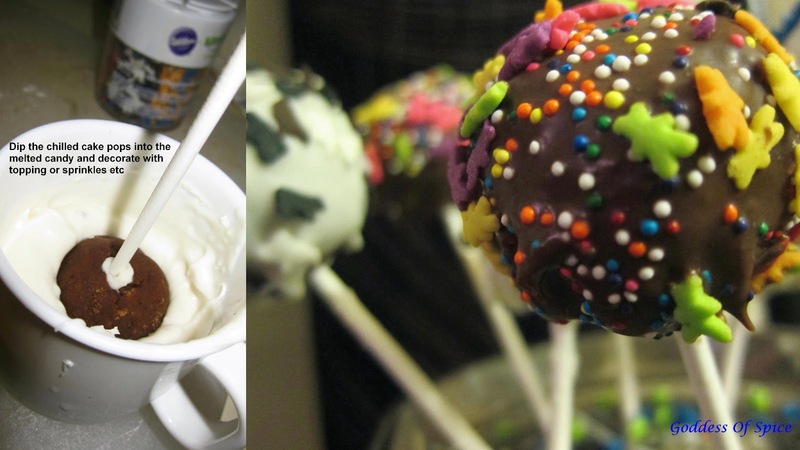 Too much frosting would turn it into a soggy mess and your cake pops won't have the desired texture. After coating the cake pops with the melted candy, immediately decorate them with the sprinkles as the candy sets pretty fast and the sprinkles won't stick once it sets. Thx Meera, come over, we'll celebrate alright! Hey Priya congrats ! And the pops looks delicious. Good keep going. Congrats Priya. The cake pops were perfectly made.